Erin Adams (1/18) is a mixed media artist and owner of Brainworks Inc. Erin’s artwork involves street sourced advertising posters collaged then painted with familial themes involving gender, class, race and Los Angeles culture. She also works with dioramas and installations. Adams spent several years as an independent art director for music videos and commercials after graduating from Otis College of Art and Design. As owner of Brainworks Inc. since 1988 she has worked on hundreds of design and decorating projects in Los Angeles and beyond with projects ranging from recent updates to the Greek Theatre to The Forum Shops in Las Vegas. Brainworks Inc. since 1988 C33 Licensed contractor, insured and bonded As a community organizer to her Pico Bl. neighborhood Erin has been involved since 2015 in “The Great Streets Initiative” She has worked with business owners, neighbors and city officials to enliven her diverse community. Nancy Baker Cahill, Chair (3/16) is a multi-disciplinary artist and founder of 4th Wall, a free Augmented Reality (AR) app which allows users to place art in 360 degrees anywhere in the world. She also created the ongoing, collaborative, AR public art exhibition Coordinates, a new feature on her app, which allows individual artists to activate their work in site-specific locations. She received her B.A. from Williams College and began her career describing TV and movies for the blind and visually impaired at WGBH in Boston. From 2010-2012 she initiated and led a collaborative art project at Homeboy Industries called “Exit Wounds.” Works from this project were exhibited throughout Los Angeles as part of the Craft and Folk Art Museum (CAFAM)’s “Folk Art Everywhere” program. In 2015 she designed and led a collage workshop with homeless individuals under the aegis of a CAFAM grant. She is the recipient of an ARC Grant from the Center for Cultural Innovation. Baker Cahill was a featured TEDx speaker in September 2018 in Pasadena, was recently profiled in a Bloomberg Media Art and Technology short documentary, and will be honored as an “Impact Maker to Watch” at LA City Hall in mid-January. Solo exhibition highlights include the Pasadena Museum of California Art, her Virtual Reality (VR) public art project on the IF (Innovation Foundation) sponsored Sunset Digital Billboards, and a VR/AR event at LACE (Los Angeles Contemporary Exhibitions) in April 2018. She has been profiled by Forbes Magazine, ARTnews, Fast Company, The Smithsonian Magazine, The Art Newspaper, VRScout, ZDNet, the Los Angeles Times, KCET’s award-winning “Artbound” series, Aesthetica, Good Magazine, LA Magazine, LA Weekly, La Stampa, Peripheral Vision Arts and on several podcasts, including Feminist Crush, Bookish, and State of the Art. She served for years as a member of the Hollywood Public Art Advisory Board, is a member of the Pasadena Art Alliance, an Advisory Board member of Fulcrum Arts and Vice Chair of the Board of Directors at LACE. Charlene Fitzgibbon, Vice Chair (1/19) is an accomplished communications consultant and event producer with a deep passion for music, culture and the arts. 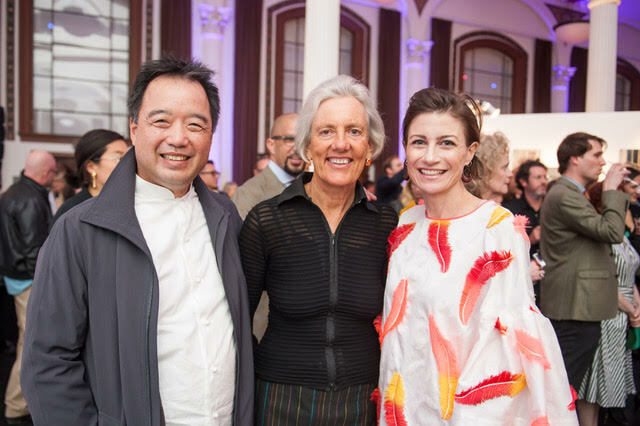 Her investment in the arts is driven by a fierce belief in its power to shape positive impact in the world. Fitzgibbon is focused on collaborating with creatives to develop and produce experiences and programs to tell compelling stories, drive meaningful connections, and build community globally. Brooklyn, NY native, Fitzgibbon is based in Los Angeles. She garnered her public relations, branding, and marketing expertise working in the digital entertainment and technology space at LAUNCH Media, Yahoo! and Comcast Interactive Media. As a consultant she has spearhead multi-faceted strategic programs and events for brands, institutions and foundations, including: KCRW, Ingrooves Music Group, Hammer Museum, and Beats Music. Fitzgibbon holds a BA in Art History from Trinity College. Andrea Collins, Treasurer (12/17) is a Portfolio Analyst at City National Rochdale. City National Rochdale, a subsidiary of City National Bank, is an investment management firm specializing in intelligently personalized portfolio management for high-net-worth individuals, families, and foundations. Since 2005, she has dedicated her career to working closely with each client’s advisor to developing portfolios based on the client’s investment objective, time horizon, income needs, and tolerance for market volatility. Prior to joining City National Rochdale, Ms. Collins worked at Morgan Stanley Wealth Management, in Beverly Hills, as a Senior Associate providing comprehensive investment planning for co-managed portfolios. Ms. Collins holds a dual degree from the University of California, Berkeley in Economics and History of Art and is currently pursuing Level I candidacy for the Chartered Financial Analyst designation. Her passion for the history of art was first highlighted, in high school, during an AP Art History course and further cultivated during her work at the Berkeley Art Museum and study abroad program in Florence, Italy. Active in the community, she serves as a member of the Juvenile Diabetes Research Foundation, on the City National Bank Business Development Committee for the Multicultural Strategy Initiative – Black Colleague Alliance, and has served as a panelist for the California Diversity Council Multicultural Leadership Roundtable. She frequently teaches financial literacy workshops for schools and organizations in an effort to bridge the awareness of the correlation between financial stewardship, wealth management, and legacy building. Beatriz Cortez (1/19) is a Los Angeles-based artist and scholar. She was born in El Salvador and has lived in the United States since 1989. Her work explores simultaneity, life in different temporalities and different versions of modernity, memory and loss in the aftermath of war and the experience of migration, and in relation to imagining possible futures. She has exhibited her work internationally at the Whitney Museum of American Art in New York, the Hammer Museum in Los Angeles, Ballroom Marfa in Marfa, Texas, BANK Gallery in Shanghai, China, Museo de Arte y Diseño Contemporáneo (MADC) in San José, Costa Rica, Museo MARTE in San Salvador, El Salvador, MET Quito in Quito, Ecuador, among others. She has received the 2018 Rema Hort Mann Foundation Fellowship for Emerging Artists, the 2017 Artist Community Engagement Grant, and the 2016 California Community Foundation Fellowship for Visual Artists. She holds an M.F.A. in art from the California Institute of the Arts, and Ph.D. in Latin American literature from Arizona State University. She teaches in the Department of Central American Studies at California State University, Northridge. Kenturah Davis (10/13) is a Los Angeles artist and has produced work for exhibitions, artist collaborations, film and commissions. The core of her work oscillates between portraiture and design, exploring themes related to the body and the formation of identities. Davis is the featured visual artist in the syndicated documentary, “Ray Charles America” that aired on A&E Network. She is a collaborator in Andrea Zittel’s Smockshop and Panelshop projects, designing product for the artist enterprise and representing the group in national and international exhibitions. Last year’s Mis-Design exhibition at the University of Melbourne’s Ian Potter Museum included two works by Davis. Michael Delgado (12/16) is the owner and Executive Publisher of the A.G. Geiger Fine Art Bookstore and Press that specializes in current California based artists from the mid 20th century to the present. A.G. Geiger opened in Chinatown, Los Angeles in the Spring of 2016 and showcases a carefully curated collection of rare exhibition catalogs, monographs and fine art books. A.G. Geiger has its own imprint called California Art Books that will catalog contemporary Los Angeles artists through quarterly issues and related events. The first installment is planned for the Spring of 2017. A.G. Geiger also presents artist/ curator talks, music and other special events including an art book fair. He is a graduate of the USC School of Fine Art, former art writer for the LA Weekly and Editor of the Journal of the Los Angeles Institute of Contemporary Art (LAICA). After LAICA, Mr. Delgado became the Executive Director of Business Development for iNTELEFILM, a publicly traded holding company for five prominent film and television production companies. He also earned Executive Producer credits with MTV and IMG for action sports specials featuring Shaun White. Jessica Fleischmann (3/19) is founder and creative director of Still Room Studio, a graphic design practice in Los Angeles that specializes in socially engaged cultural work. Clients include Art Omi, CalArts, City of Los Angeles Department of Cultural Affairs, Edward Cella Art & Architecture, Ghery Partners, Hammer Museum, the LA Philharmonic (with Content Object), LACE, Library Foundation of Los Angeles, Luce et Studio, MASS MoCA, Night Gallery, REDCAT, Save the Children, Woodbury University School of Architecture, Productora, and cultural organizations, architects, writers and restaurants throughout LA and beyond. Jessica was on the board of the LA Forum for Architecture from 2013 through 2018, and is a member of the Pershing Square Renew team lead by Agence Ter. Her work has been recognized by the AIGA, Print Magazine, Under Consideration’s FPO Awards, the MAGGIE Awards, Mohawk 100 (Best in Show), the British Book Design and Production Awards, among others, and been published in several books on graphic design and typography. Her work has been exhibited at the A+D Museum, WUHO Gallery, and at CalArts, among others. Before establishing Still Room, Jessica Fleischmann was Art Director of Western Interiors and Design magazine and design associate at Lorraine Wild Design (now Green Dragon Office), and with Greybull Press. She received an MFA in Graphic Design from CalArts in 2001, after obtaining two liberal arts degrees and working in non-profit arts management, as a chef, and as an art instructor. She has taught graphic design and typography at Otis College of Art and Design, USC, and SCIArc. Michael Gonzales (1/19) is a Los Angeles based land use attorney, founded Gonzales Law Group APC (“GLG”) in August 2011. Prior to founding GLG, Michael practiced land use and real estate law for over 8 years at two Los Angeles based law firms. Michael has successfully run his boutique law practice for the last 7 years, implementing the development and construction of various hotels and multi-family projects. Whitney Gore (10/17) is a director for global original series at Netflix and handles legal affairs for scripted projects developed or produced in the United Kingdom, United States and Canada. Prior to Netflix, Whitney was the director of legal affairs for Legendary Entertainment’s television and digital media divisions, which included an independent studio that produced shows distributed on a variety of networks and platforms, including Netflix, Amazon, Hulu, USA and ABC. Before moving into law, Whitney worked as the director of business development for On Demand Books, a technology and media start-up in New York City, as a project associate for the National Democratic Institute for International Affairs, a nonpartisan NGO in Washington, D.C. and as an investment researcher for a Canadian private holding company in China, the latter where she developed her love of contemporary art spending time at Beijing’s 798 Art Zone and Shanghai’s M50 Art District. Whitney grew up in Canada, received her B.A. from Mount Holyoke College in Massachusetts and her J.D. from Loyola Law School Los Angeles. Amy Knoll Fraser (7/17) is a veteran of the Los Angeles restaurant scene. She opened her first restaurant, the critically acclaimed and award winning Grace, with her partner Chef Neal Fraser in 2003 and their second, the late BLD, in 2006. In 2012 Knoll Fraser, Chef Fraser and their partners took over operations of Vibiana. Knoll Fraser has successfully merged the Fraser’s distinct handcrafted approach to food, beverage, and service with the beauty and history of one of the city’s most stunning architectural gems. In addition to events at the facility, Knoll Fraser and her partners opened Redbird, the Fraser’s follow up to Grace, in the rectory building adjacent to the Main Hall in early 2015. Most recently, Knoll Fraser and Fraser launched their fast-casual concept, Fritzi Coop. They currently have two locations, one at the Original Farmer’s Market at The Grove, and a second standalone restaurant in the Arts District. Knoll Fraser currently resides on the Los Angeles Food Policy Leadership Board, the California Restaurant Association Los Angeles Board and is a charter member of the Dine LA Restaurant Week Advisory Board. Molly Larkey (1/16) is an artist, writer, and activist based in Los Angeles, CA. Her work has been featured in exhibitions at PS1 MoMA, New York; The Saatchi Gallery, London; LACMA, Los Angeles; The Drawing Center, New York; Luis de Jesus Los Angeles; Ochi Gallery, Ketchum; Human Resources, Los Angeles; Commonwealth & Council, Los Angeles, among others. Margaret Reeve, Secretary (1/15) is a freelance communications consultant with 34 years of experience in higher education. She served as Director of Communications at Otis College of Art and Design from 2003-2014, creating strategic marketing campaigns that included print and digital messaging. Previous positions include Director of Exhibitions and Lectures at Harvard Graduate School of Design, and Director of Publications at Southern California Institute of Architecture (SCI-Arc). She was architecture editor for Art New England, contributing writer for The Boston Globe, editorial consultant for the Getty Center for the History of Art and Humanities, and freelance curator. She is currently teaching literacy and writing workshops as a volunteer at 826LA, and past volunteer activities include the LA Forum for Architecture and Urban Design, and Somerville Arts Council. She directed art galleries in Boston and Provincetown, and earned her BA in art history from Wellesley College. Bryan Smiley (1/19) is an experienced media professional, and Vice President of Creative Development & Production at Columbia Pictures; a Sony Pictures Entertainment company. Before joining Columbia, Bryan co-founded No Label Productions, a multicultural film and television company. Prior to No Label, Bryan consulted for several top media companies including Fox Digital Entertainment and Fox Digital Studios. At Fox, Bryan worked across multiple divisions, creating a new business model to produce, market and distribute feature films starring top social influencers. Previously, Bryan worked as Executive Director of Home Entertainment & New Business Development for New Regency Productions, an award-winning film and television company. In that position, Bryan helped shape and implement New Regency’s global home entertainment strategy by managing New Regency’s extensive film library. In his business development role, Bryan focused on digital strategies and initiatives, with an emphasis on creating new revenue streams through emerging technologies and platforms. Li Wen (7/16) AIA is a Principal and Design Director at Gensler, a global design practice that he joined in 2006. He has over 25 years of experience and is responsible for leading the design on many of the firm’s corporate, creative office and civic/cultural projects, including MGM Place in Beverly Hills, the LAPD Memorial to Fallen Officers, Playa Jefferson creative office campus, and the AltaSea campus at the Port of Los Angeles. In addition, he is a leader on the team responsible for formulating research and development on special projects out of the Los Angeles office, which include the visionary Network_LA Transit, the firm’s Environmental Mapping Tools, and most recently, the Pershing Square ReVision and CAPACITY. Li has also acts as lead editor for the Gensler’s Ideas_ journals, which he created and established in 2008. Li has both served as a SouthWest Regional Design Leader, and as a Firm-Wide Design Leader for Gensler, responsible for driving the design culture of the firm at various scales of purview. Li is a graduate of the Yale School of Architecture, receiving his Masters of Architecture degree in 1988. As a long-standing member of the AIA, Li has served on the LA Chapter Board twice as well as on its Executive Council and the AIACC Board. Li has been on the Los Angeles Mayor’s Design Advisory Panel, has served as a panelist for the Los Angeles Cultural Affairs Department’s Public Art Administration Program, and until recently co- chaired the Economic Development Committee for the Hollywood Chamber of Commerce. He has been a design faculty member at the University of Southern California School of Architecture, and continues to serve on design juries at the architecture Schools of USC, UCLA and Woodbury. Li has lectured at USC, Yale, Cal Poly Pomona, Mobius LA, the LA Architecture Forum, and the AIA|LA Design Convention. His work and ideas have received numerous awards and have been published in numerous publications including The Los Angeles Times, Architectural Record, Interior Design, Interiors, ArchDaily and Fast Company.